The former wealthy merchant city, Brussels is now the administrative capital of Europe. Today this city is a comfortable place for tourist: English is in widespread use, lots of democratic cafes and chic restaurants. Here, the area of ​​parks per capita ranks second in the world (after Washington). The convenient location allows getting to Paris in an hour, to Amsterdam and Cologne- in two hours. The sights of the Belgian capital are pompous: the architectural ensemble of the Grand Place, narrow ancient streets, and chocolate boutiques in the Royal Galleries of St. Hubert. You could see them all with the help of car rental in Brussels Zaventem Airport. The surprising combination of Baroque, Gothic and modern styles are perhaps reflecting one of the main principles of modern Europe – non-stop progress with careful preservation of the historical heritage. Many hotels in the city are located in the historical buildings. You may get lucky to stay in one of them. 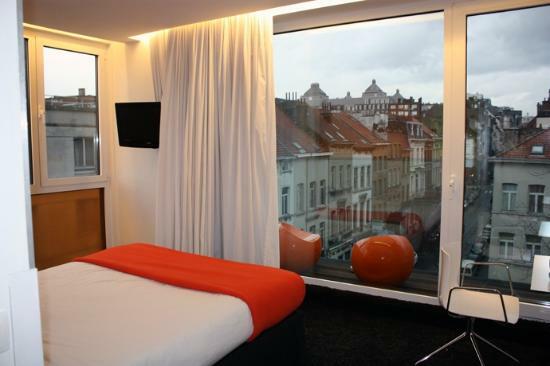 Here is the list of five most comfortable 3 star hotels in the capital of Brussel. The Made in Louise is a Brussels boutique hotel, ‘where charm is a way of life’. This hotel was established in 2011 by a sister and a brother, whose experience gaining at the hotel industry started in the year 2000. Having excellent location (next to the streets, where the shops with expensive trendy cloths are), this small charming hotel is situated at a quiet, fine district. The building of “Made in Louise” hotel was built at early 20th century. The careful attention was payed to the historical features, style and essence of the building. There are 48 bright and comfortable rooms at the hotel; each is having its own character. On the first floor, you can play a miniature pool. Inside the hotel, everything is modern, black and white, while cozy and refined. Visiting this hotel, you get a big clean room in a good district. Even the smallest details of the interior are carefully thought-out, showing the finest taste of the hotel owners. The breakfast is wonderful- in addition to the classic omelets and pancakes, there are their own made muesli and jam, which could be bought at a local store nearby. The friendliness, hospitality, flexibility and anticipation to the needs of the guests, together with clean rooms and total comfort are making your stay truly pleasant. The narrow street with small monotonous houses, where hotel Orts was once build, was established in year 1877. 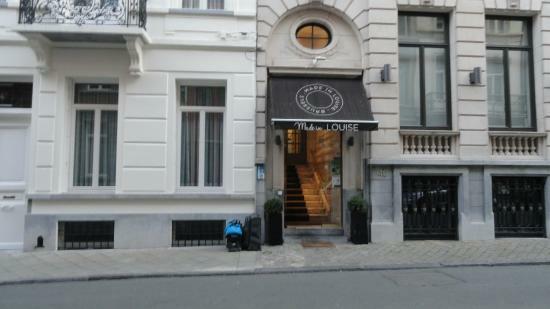 And now, adjoining other majestic buildings in the wide district, where stylists are creating and selling their works, this comfortable hotel is situated just in 50 meters from the Brussels’ Grand Place and the Bourse. You will feel that this place is unique, when you enter it through the bar, where the counter is somewhere in the corner, and in front of the entrance there is an owner’s big dog sleeping. In the evenings, a DJ plays in the bar. The staff at the hotel is very friendly. The owner of the hotel is benevolent, often seen behind the counter. The hotel is in the city center – close to the station, and of course, to many places of interest. The subway is just next door, there are many cafes and shops nearby. The rooms are clean and comfortable. The parking is possible only at the area near the hotel. The Wi-Fi is free. Moreover, of course, there is a restaurant, a snack bar, a minibar and an included breakfast in the hotel. If you are going to watch many of the city places of interest- Hotel Van Belle is the perfect match for you! It is situated in Anderlecht, which is one of the eldest Brussels’s districts, not far from to the Museum of the Gueuze and just close to the new Parc de la Rosée. The Brussels city center is simply at walking distance. For example- the famous Grand-Place of Brussels, Place Saint-Géry and Place Sainte-Catherine are in about only 10 minutes’ walk! There are many trendy clubs, bars and restaurants near the hotel and even a retro-style bar at the hotel. The hotel offers its guests free WI-FI, fresh bed linen and robust breakfast. The comfortable stay is provided with the help of relaxing and quiet lounges in a low-energy house. There are about 100 rooms at the hotel- 75 of them have been renovated to more functional. Hotel Van Belle renders a service of giving a lift from\to Brussels-South railway station. The service is possible on request at 9.00-23.00. In addition, there is a hotel’s underground private parking. It is located on the corner of a quiet street, there are 24-hour grocery stores nearby. The main shopping street could be reached by foot. The hotel is within walking distance from the tram stop, from which in 10 minutes-time you can easily reach the center. Pantone hotel is distinguished by a simple but stylish design – every floor is in its own color scheme- the name of the hotel speaks for itself. You may choose the color of your room, among those, which are vacant. Even a souvenir shop at the reception completely keeps up to the concept of the hotel. All rooms are soundproofed, bright, clean and modern, with large windows. You will have free Wi-Fi and luxurious beds. In addition, the rooms are decorated with the pictures, made by the local photographer. The breakfasts are prepared from the top quality products. You would be offered not only common continental breakfast, but also such famous Belgian morsels like Liège syrup, waffles and Chimay’s cheese. This design hotel is situated in 50 meters from the fashionable Avenue Louise and it would take you just 10 minutes on foot to get to the Grand Place. There are 29 stylish rooms, which look like you have traveled to funky and retro past. The breakfasts are prepared from the freshest products, which are brought from the best Brussels’s market gardeners and bakeries. Making a feast of delicious breakfast, you would be sitting at relaxed atmosphere, listening to 60s-70s vinyl records. The Belgian best sommelier of the year 2009 is working at the Vintage Wine Bar, offering world’s most excellent wines and a variety of Belgian beers. There is an opportunity to stay at 1958 American Wally Byam travel trailer on the Vintage Hotel secure terrace. The trailer is totally renovated with the help of quality materials. It is having fine bedding, Wi-Fi, a separate toilet, a comfortable shower, a plasma TV, hot and cold AC and a cozy seating area. Over The River and Through The Woods… In An RV?